The Girls Initiatives at the YW reflect our core belief that empowered girls become empowered women. Designed to inform, engage and inspire girls in New York City to become self- advocates, the goal of our Girls Initiatives is to ensure that every girl gains the skills, knowledge and confidence to pursue the education, career and life options of their choice. 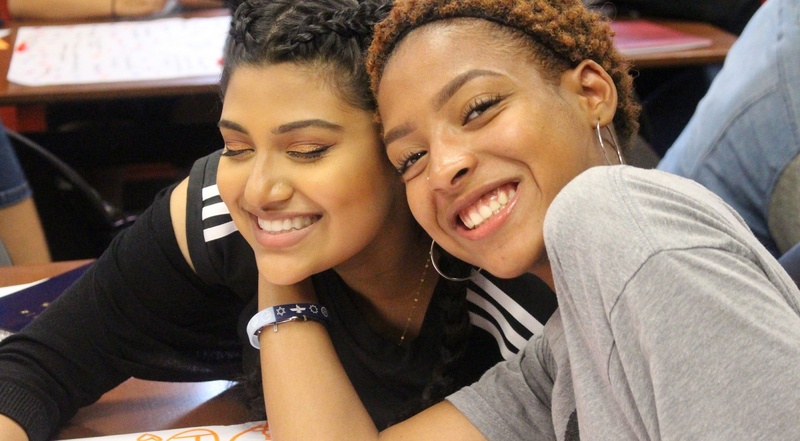 Girls Initiatives are FREE programs open to ALL high-school aged (14-18) self-identified girls and gender non-conforming youth in New York City with No Academic Requirement. Programs are held at YWCA -Girls Initiatives located at 500 West 56th Street between 10th and 11th Avenues. The YWCA of the City of New York Amplifying Multiple Perspectives (AMP) Leadership© Program offers young people aged 14-18 from diverse backgrounds a dynamic and innovative approach to developing their leadership skills. Through an examination of social identity, girls will have the opportunity to advance gender equity and racial justice, becoming agents of change in their community and expanding their social justice network. Meet Our Step In & Stop It Facilitators: Schedule a Bystander Intervention Training! Our programs offer self-identified high school girls and gender non-conforming youth a challenging STEM experience, regardless of their prior involvement in the field. Participants come together and learn from the best about STEAAM (Science, Technology, Engineering, Art, Activism, and Math), within the context of social identity and community. Exposure to professionals in the field builds their networks and inspire future possibilities. Come create in our new maker space! Use the 3D printer, laser cutter, recycled electronics, or traditional art supplies to build creative projects. Open Tuesday – Thursday after school until 7:00pm by appointment. Interested visitors will be dedicating their time in the Maker Space to complete projects, enter design competitions, create social media content, and other structured independent work. Email Vanne-Paige Padgett at vpadgett@ywcanyc.org for group reservations. Throughout the year, the YW offers opportunities for our youth to engage in explicit conversations around college at all grade levels, addressing three major themes: identifying college selection criteria, identifying characteristics of a college-ready student, and determining college-student match. Youth will also be exposed to a variety of careers and professional women, engaging in experiential learning to deepen knowledge through practice as well as ongoing mentorship opportunities and coaching in a career interest. Convenes 200 girls and women leaders from diverse backgrounds to dialogue on gender equity for 21st Century Girls. The symposium unites intergenerational and multiracial voices to promote understanding, dialogue and social action on critical issues facing girls in New York City. The YWCA seeks to amplify girls’ voices among women advocates, generate a comprehensive New York City Girls agenda and create a network of influential women and organizations to advance policy and opportunities for the next generation of women in school, career and life. As a result of this symposium, we hope to see an increase in attention, public discourse and funding on gender equity in New York City and across the nation. SAVE THE DATE: April 2020! Questions or comments about our Girls Initiatives? Tell us below! Select from initiatives below that you are interested in. Have any thoughts or questions? Let us know.